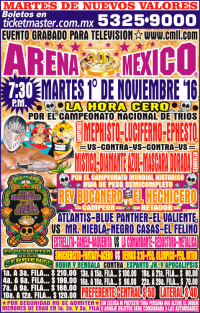 Hechicero took falls 2/3 to win the title, surviving a piledriver and submitting Rey to his rolling half crab. Bucanero falls on his fourth defense. 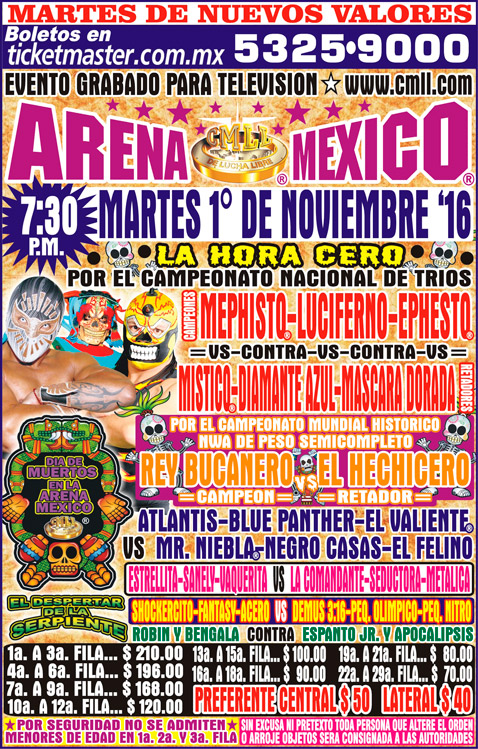 Hechicero is the 6th/71st champion, and this is his first CMLL championship. 16:33. Rudos took 2/3. Esfinge was being checked on at the finish. 13:39. Dalys kept the title in her sixth defense. 7:09. straight falls. 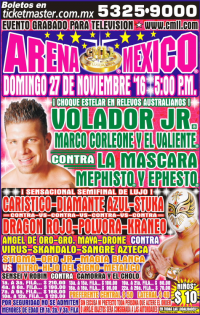 An eliminated La Mascara snuck in to foul Volador. Yeska's return to the promotion after six years. Tecnicas took 1/3, Sugehit submitting Seductora to her La Regia submission. Azul took 1/3, the last with a German suplex that left Terrible stretchered out. 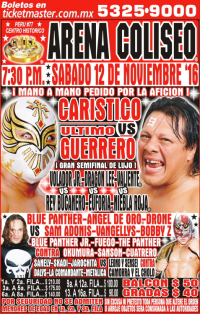 Tecnicos took 2/3, UG fouling Caristico, setting up a singles match next week. Nitro replaced Euforia. Tecnicos took 2/3. Euforia replaced Mr. Niebla. Tecnicos took 2/3. debut of Sangre Imperial, a son of Sangre Chicana. 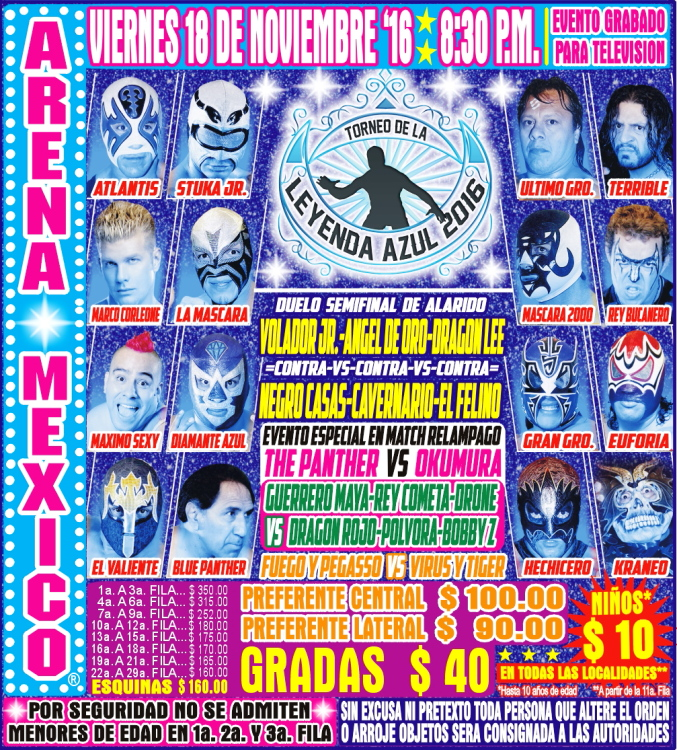 Dinamitas unmasked Blue Panther Jr. for the DQ. Niebla Roja replaced Vangellys. Tecnicos took 2/3. Vangellys replaced Shocker. Tecnicos took 1/3. 8:45. Tecnicos took 2/3. Espanto Jr. suffered a lower leg/foot/ankle? injury on a baseball slide, while Flyer was hurt on a badly botched springboard in the second fall. 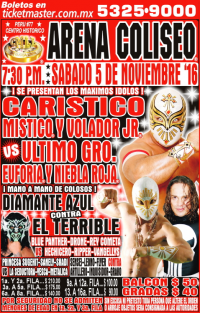 Caristico took it with La Mistica in 8:55.
tecnicos took 2/3, the last with Mascara Dorada beating Casas with the casita. The locker room came to the ring to congratulate Dorada and Dorada said farewell to the crowd. 2:48. 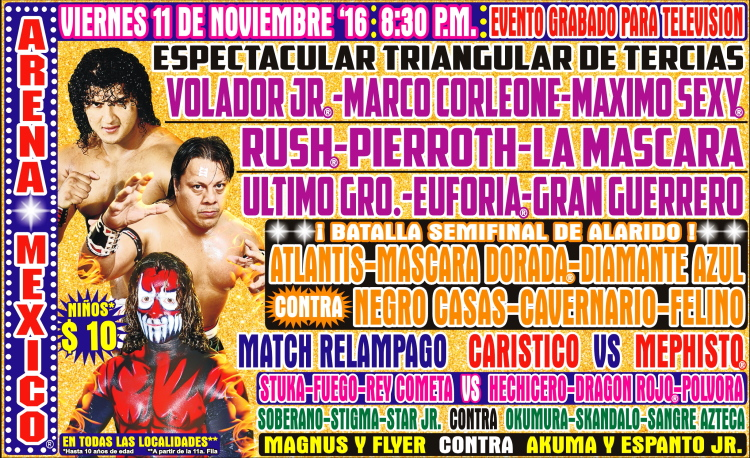 Volador tossed Mascara, UG tossed Mascara nearly at the same time. Rush fouled Volador and faked his own foul to draw a DQ win. UG blocked Rush's foul and cleanly beat him with Pulpo Guerrero. Tecnicos took 1/3. Adonis had a USA flag with Donald Trump's face on it. 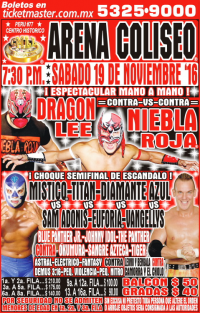 Tecnicos took 1/3, the last when Niebla Roja unmasked Dragon Lee. UG took 2/3, the last by sneaking in a foul. 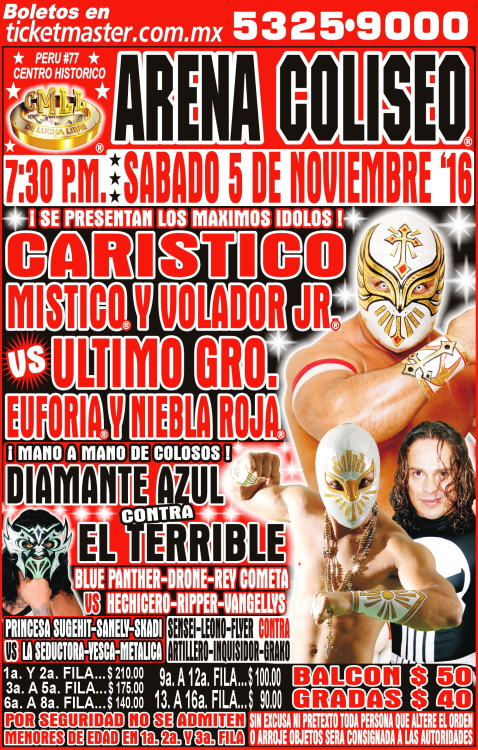 Tecnicos took 2/3, Mascara fouling Marco and Ingoberneables unmasking Diamante Azul for good measure. Magia Blanca's first match here since the March Gran Alternativa. Rudos took 1/3. 11:36. 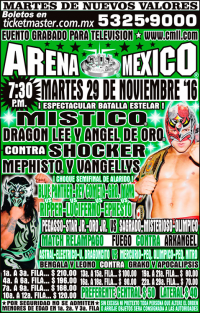 Tecnicos took straight falls, the last when Dragon Rojo unmasked Guerrero Maya Rojo. 8:59, Panther winning with a frog splash. 34:34. 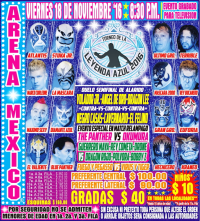 Order of elimination: Stuka (Gran Guerrero), Blue Panther (Maximo), Rey Bucanero (Diamante Azul), Gran Guerrero (La Mascara), Maximo (Mascara 2000), Marco Corleone (Kraneo), Hechicero (Euforia), Kraneo (Atlantis), La Mascara (Valiente), Terrible (Ultimo Guerrero), Euforia & Diamante Azul DDQ for pulling masks, Maximo (Ultimo Guerrero), Atlantis (Vailente), Ultimo Guerrero (Valiente) leaving Valiente as the winner. Artillero replaced Espanto Jr. (injury) on Monday. Rudos took 1/3. Robin replaced Oro Jr. Straight falls. Drone got unmasked for the DQ by Skandalo, but still hasn't lost a fall. 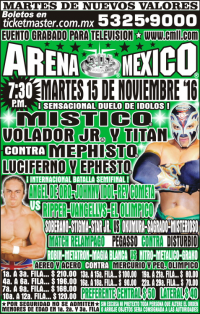 4) Misterioso Jr., Morphosis, Pierroth b Ángel de Oro, Guerrero Maya Jr., Stuka Jr.
Pierroth replaced Ephesto on Friday. Rudos took 1/3. 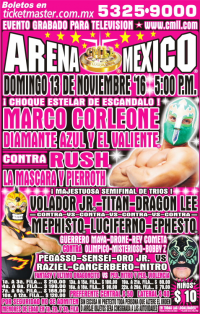 Ephesto replaced Pierroth on Friday, Marco replaced Maximo at some point. 10:22. Rudos took 2/3. Fuego replaced Stuka. 8:36. Tecnicos took 1/2, the last when Mascara fouled Maximo. Stuka replaced Marco. 17:20. 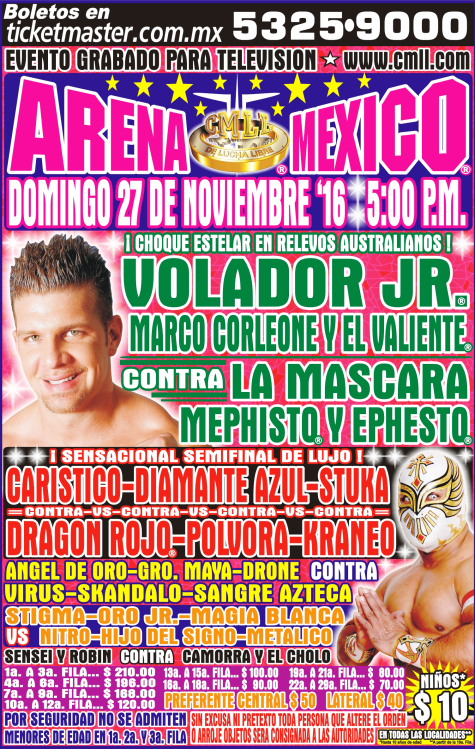 Volador 12th defense, as he takes falls 2/3 to keep the title. Rudos took 1/3. Aereo replaced Astral on Friday. 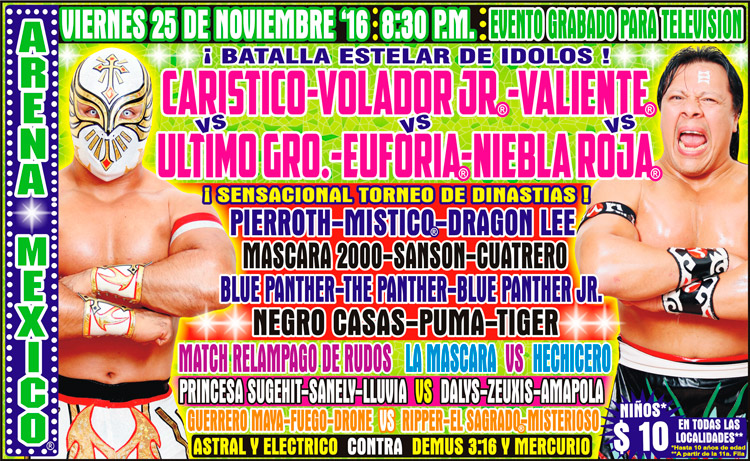 Electrico was hurt on the Demus Driver. Rudos too 1/3. Drone's was pinned at the end - it technically didn't count, but visually it was as if he did. Double knee smash in 8:15. 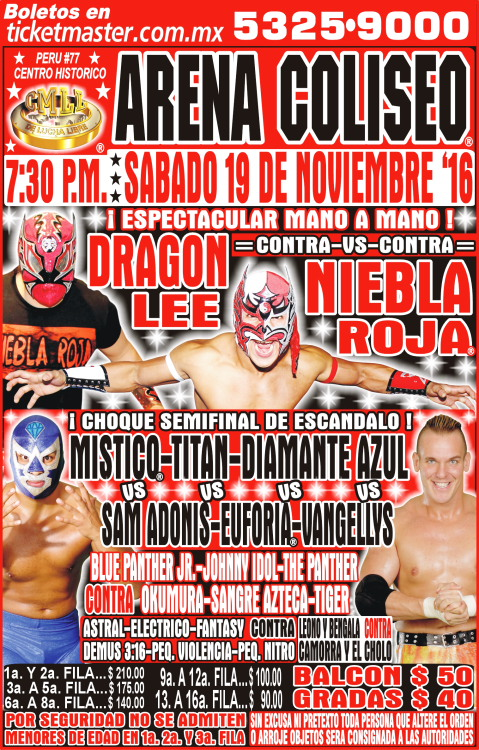 Dinastia Casas will get a national trios title shot next week. Rudos took 1/3. UG snuck in a foul on Caristico after the two feuded. 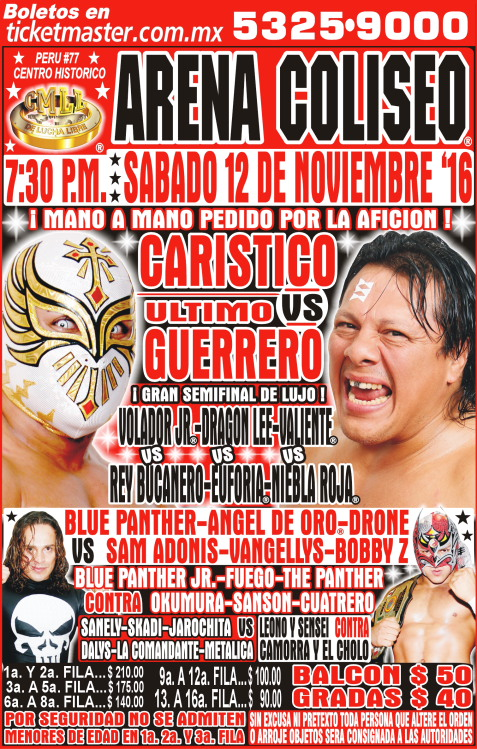 Caristico and UG set up a rematch for next week. 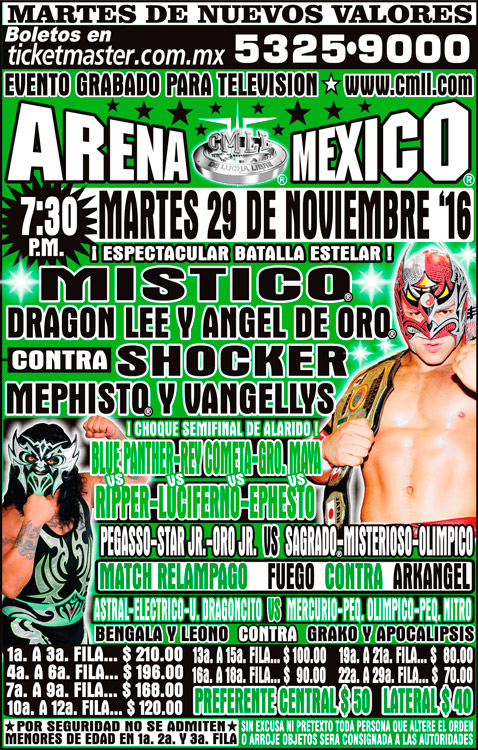 4) Dragón Rojo Jr., Kráneo, Pólvora b Carístico, Diamante Azul, Stuka Jr.
5) Ephesto, La Máscara, Mephisto DQ Marco Corleone, Valiente, Volador Jr.
Rudos took 2/3, the last when Mascara faked a foul. 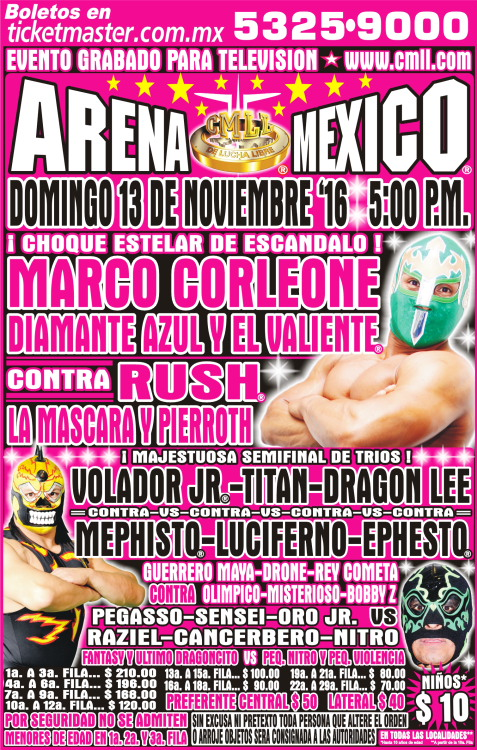 Pierroth replaced Ripper. 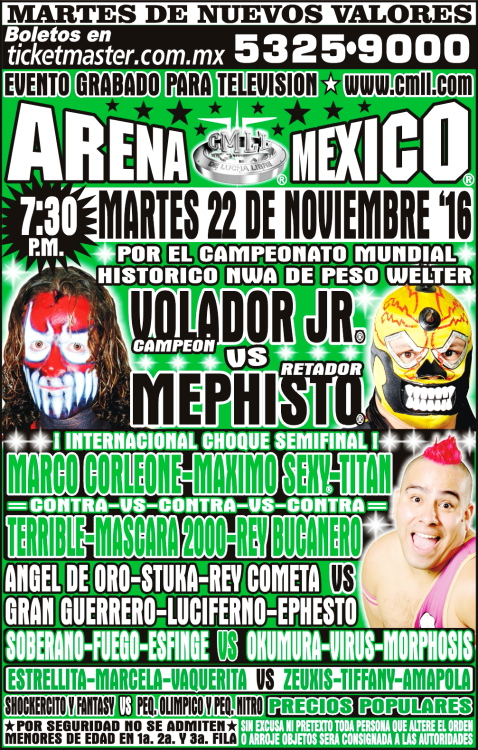 Rudos won in straight falls, Ephesto sneaking in a foul Maya. 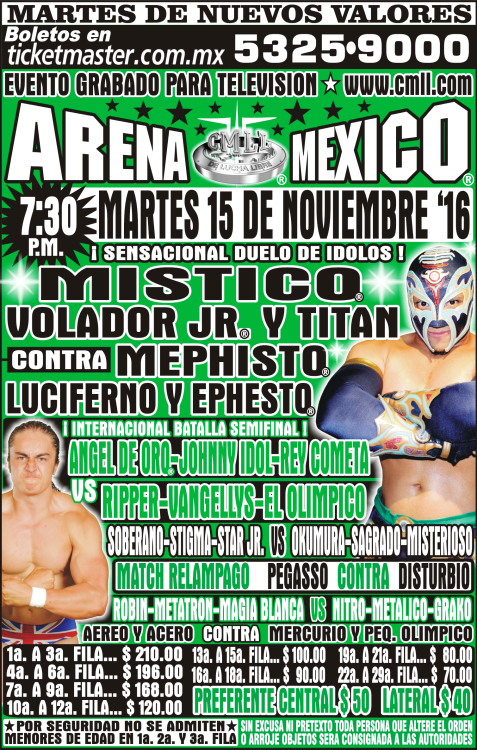 Ripper replaced Mephisto (though Pierroth was listed there this morning.) Rudos took 1/3.